When the weather outside is frightful, Tucson remains incredibly delightful. Every year gem, jewelry and fossil hounds flock to the Arizona city in search of the newest finds and 2018 is no exception. JOGS Tucson Gem and Jewelry Show is one of the leading Jewelry events in North America for all jewelry industry professionals and it is one of the key jewelry markets in the world. For jewelry and gem hunters and related businesses JOGS Tucson Gem and Jewelry Show is an absolute must to attend. The Show brings together international and national dealers who are direct source jewelry manufacturers, miners, stone cutters, carvers, jewelry designers and importers from around the world. Online boutiques, gifts shops, TV channels, jewelry stores come to the Show to replenish their stock with the latest and greatest products, many of which are only available during the winter JOGS Tucson Show. When and Where: The 2018 JOGS Show runs from January 25 to February 5, 2018 at the Tucson Expo Center. The best days to come are January 25 – 28, 2018, as the Show hosts a shorter-duration SuperStart Pavilion which is only available during the earlier part of the Show. The Tucson Expo Center boasts thousands of free parking spots, and is a main shuttle hub for the gem show shuttle routes. If you are already attending the AGTA Show, you can even take a free limo ride from AGTA to JOGS! In addition to free parking spots and shuttles, JOGS offers International food court and business and shipping services for JOGS attendees. Highlights of the Show: The JOGS Tucson Gem and Jewelry Show includes dealers from all around the world, hosted in the 155,000 Sq. feet indoor air-conditioned expo center. The Show will also be hosting unique exhibit: the world’s largest giant killer clam fossilized pearl, and a giant extinct killer clam shell. Tickets and Entry: Registered buyers with a Tax ID and business related buyers can attend the Show free of charge, and guests can buy tickets online before the Show or at the door. Registered buyers are also treated to a free Champagne Brunch Buffet at the Show, and a one-night-only special networking party. 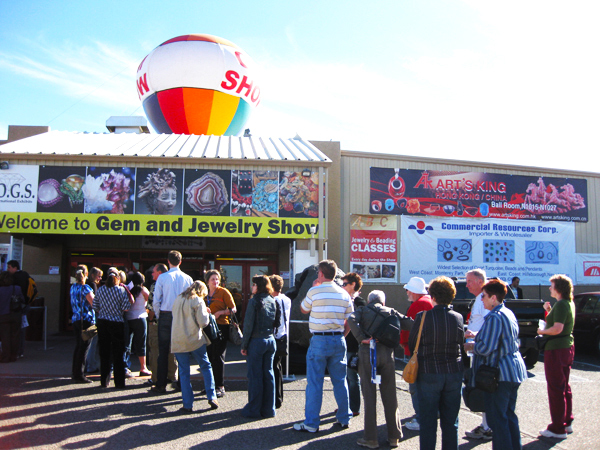 The JOGS Tucson Gem and Jewelry Show brings approximately 40,000 visitors to the Tucson region annually and generates tens of millions in direct spending, making it one of the largest US annual events both in visitors and dollars generated. If you are interested in attending the Show as a buyer, guest or exhibitor visit http://jogsshow.com/, call (213) 629-3030 or email JOGS at info@jogsshow.com.